His unyielding belief in the power of self-reliance; and how perseverance can lead to growth and success, when lesser souls may have just given up. It’s an attitude born of growing up and living in dairy farm country in North East Michigan, just 20 miles from where he was born – a farming community about 90 minutes north of Detroit. It has been a tough go for the locals there: the economy has been difficult owing to turbulence in the worlds of auto-manufacturing and dairy farming. Knaggs grew interested in trucking from a relatively young age. Knaggs now runs a 40-truck operation out of Carsonville, Michigan, with a second location in Dearborn. 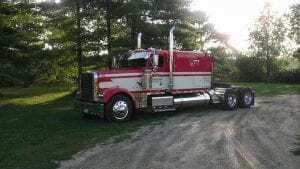 He provides primarily flat-bed service, hauling scrap metal to a brass manufacturing facility, and then hauling out finished product to stores and warehouses across the US. His Dearborn location provides dry van service to a local Amazon facility, and to several other smaller customers. He had 5 trucks back in 2006 and has seen his business surge from to over 40 trucks as he grew in a measured and prudent manner over the years. No doubt Knaggs has seen tougher times. And it informs the way he approaches his business today. “I don’t do ‘rich’ well,” he shares, a profound statement that could resonate with a lot of other trucking company owners whose primary goal is to build a great business and provide a legacy to their children their community. “I grew up poor. I understand and appreciate what it is to work. I didn’t get into this to be rich, I got into trucking to make a way for myself, to work for the things I wanted to achieve – security for my family, employment for others in my community. As one of Tailwind’s longest customers Knaggs decided to invest in Tailwind software back in 2006. At the time he was one of the earliest adopters of new technology that could ‘separate him from the pack’. This past year, after 12 years on the Tailwind CMS system, Knaggs made the decision to convert over Tailwind’s online version. “It’s a natural evolution really. We used to remote in to the office. We understand the Cloud – its something everybody is using these days, so we thought it made sense as we grew to two offices here in Michigan. With a successful transition from Tailwind’s client server software over to its online application a few months back, Arnold looks forward to all the ways in which Tailwind’s web-based software can help his business now. With a wellspring of determination, an openness to trying new things, combined with the insight from over 20 years of trucking experience, Knaggs is in a position where he has more options than ever. But he has never forgotten the power and value of a good day’s work and knows that his success was driven by the original hunger he had to change the course of his life. Much like the scrap metal he hauls to the manufacturing facility, he has been able to take all the pieces and resources available to him in his life, and roll them all together to create a strong and durable finished product – one that endures. Today, more and more of his trucks roll further and further than before, more often than before, running better than before, and they all return back home at the end of the week because of the company’s 5-day work week policy – a nice work-life balance for his drivers, and for their families. And while many people aspire to create vast empires to accumulate wealth and prestige for themselves, Arnold Knaggs is a man with his feet planted firmly on the ground, on the farm soil of northern Michigan. Comfortable with himself and with others, serving as a model to everyone in his community, by his presence, by the success of his business. He knows that some of the best things in life are found not in faraway lands, but right here at home.